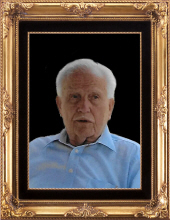 Chester “Chet” Bulen, 95, of Woodville, OH passed away on Wednesday, April 3, 2019 at Otterbein Senior Life. He was born on September 5, 1923 to Ernest and Grace (Clickinger) Bulen in Lemoyne, OH. He married Lois Margurite Sternaman on October 9, 1943. Chet and Lois raised three children and celebrated over 63 years of marriage together before Lois passed in January of 2007. He served his country in the U.S. Army during WWII in the 313th Medical Battalion in the European Theatre. He returned home and worked in maintenance at the Chrysler Corp. before retiring the first time. He would later retire from Libby Glass as an Iron worker yet a second time. His memberships included Solomon Lutheran Church in Woodville, Master Mason at F. & A.M. lodge 433 in Genoa, a life member of the Clarence L. Neiman American Legion Post #453 in Woodville. Chet was an avid bowler, and an amazing gardener that grew vegetables just to give them away. He was a man about town that was loved by all that new him. Chet is survived by his children: Janet (Billie) Ramey of Woodville, Jane Eilert of Haskins and Thomas (Beverly) Bulen of Butler, OH, 7 grandchildren, 10 great-grandchildren. 4 great-great-grandchildren and numerous nieces and nephews. In addition to his wife Lois, he was preceded in death by his parents, granddaughter: Laurie Schroeder, great-grandson: Corey Coakley, 8 sisters, 2 brothers and son-in-law, Nelson Eilert. To send flowers or a remembrance gift to the family of Chester "Chet" Bulen, please visit our Tribute Store. A Masonic Service presented by F. & A.M. Lodge #433 Genoa, will take place at 7 p.m. There will be an additional time of visitation from 10 a.m. until time of service. Officiating will be Pastor James Dumke. "Email Address" would like to share the life celebration of Chester "Chet" Bulen. Click on the "link" to go to share a favorite memory or leave a condolence message for the family.